Finance Minister Bishnu Poudel on Saturday presented a bloated budget of Rs 1048.92 billion, exceeding the Rs 909 billion ceiling set by the National Planning Commission, raising fears of another year of high inflationary pressure coupled with poor implementation. The budget, despite putting a strong emphasis on reconstruction and infrastructure development, has stretched the available resources too thin across many new and old programmes. 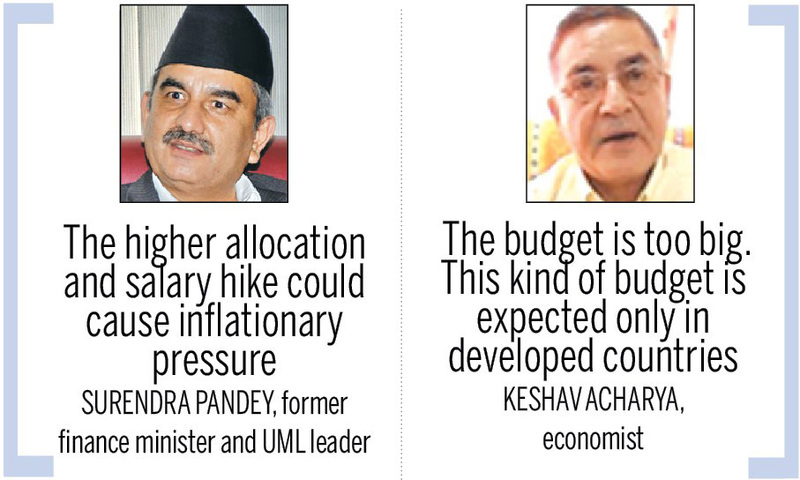 “The higher allocation and salary hike could cause inflationary pressure,” former finance minister Surendra Pandey, a member of the ruling CPN-UML, said. The government has hiked the salary of government employees by 25 percent. Pandey also described budget allocation for big projects as “somewhat scattered”. Pandey is also sceptical about the government’s capacity to spend the huge amount of budget, particularly the capital expenditure. “The budget aims to attain 6.5 percent growth, but if we don’t improve spending capacity, this is not going to happen,” he told reporters after the budget was tabled at Parliament. As agitating Madhesi parties remained absent when the government tabled its fiscal budget in Parliament, some fear it could pose a serious challenge when it comes to implementation part, given the fact how political instability has affected spending capacity in recent years.The budget has not introduced many programmes focusing on the Tarai. Resources have been allocated for border area development programme focusing on 20 districts of the eastern Tarai, while postal roads connecting many districts of the Tarai have been allocated significant budget. The government has allocated Rs4.2 billion for postal roads.With the hope of post-earthquake reconstruction work speeding up in the next fiscal year, the budget for reconstruction has been increased by 53 percent to Rs1.4 billion. The government has also doubled the allowance for senior citizens, widows and marginalised groups. The budget has given continuation to its “Afno Gaun Afai Banau” by doubling the resources for village development committees. The government has increased the budget for the controversial Constituency Development Programme (CDP). Each lawmaker now can spend up to Rs 35 million in his/her constituency. Earlier, the fund allocated for the CDP was Rs 15 million. As Nepal aims to become bridge between India and China, the budget has put strong emphasis on developing north-south roads connecting Indian and Chinese border points. The government has also announced completing the road connecting Rasuwagadhi. Funds have also been allocated for connecting another border point Hilsa in Humla. There is also a plan for conducting detailed project report of Rasuwagadhi-Pokhara-Lumbini within the next two years. The government has also announced construction of fuel storage tanks to sustain fuel demand for at least 90 days. Currently, Nepal’s fuel storage capacity is just for 17 days. The government has also sought to discourage fossil fuel imports by imposing Rs 5 per litre as “infrastructure tax”. The amount collected from infrastructure tax will be used in hydropower development, according to the budget. The government has announced exemption of electricity demand charge by 50 percent if any industry’s capacity is underutilised by 50 percent during blockade. Economist Acharya said this would help the private sector, which suffered from the blockade, to revive. The government will depend on foreign aid for nearly one third of resources. Former finance minister Mahesh Acharya, a Nepali Congress leader, said he is scpetical about government’s capacity to raise such a huge amount foreign aid. The government plans to spend foreign aid of nearly Rs300 billion.